My house is all decorated for Christmas, but I decided that my kitchen table needed a little something to “spruce it up”. 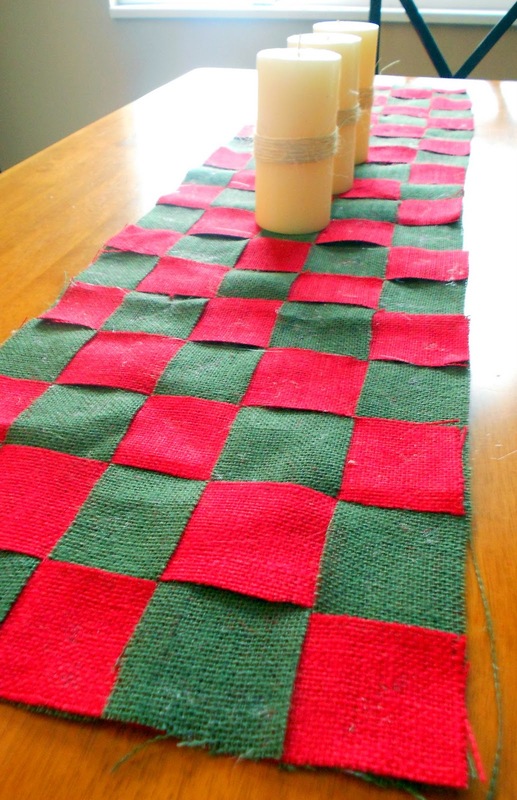 I saw a tutorial for a Jute Table Runner a couple of months ago, but thought that I could totally make it with Christmas-colored burlap. I wanted each of my strips to be 2.5″ wide, so I used a big ol’ yard stick to help me measure. I cut my green burlap into 5 long strips, each 2.5″ wide. I then cut my red burlap into 20 short strips, each also 2.5 inches wide. I repeated for the second red strip, except just did the opposite so that it would look like a checkerboard. I also only added glue on every other square from here on out. Make sure you only use a very small amount of glue, otherwise it will show through your burlap (I learned that the hard way!). Repeat until you are finished! I wrapped some thrifted candles in twine and put them in the middle for a simple centerpiece . . .
All-in-all, I finished this project in about 90 minutes and it cost me a total of $6 ($3/yd for the burlap and I had LOTS leftover . 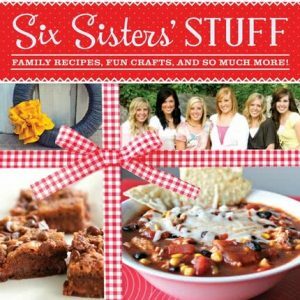 . . hmmm, what else to make with it?). I LOVE this runner! So perfect for the holiday! 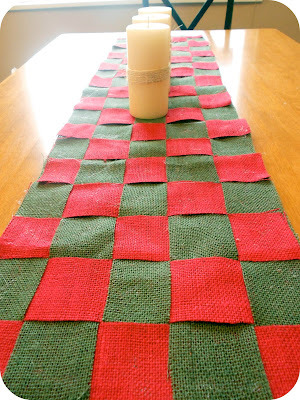 This would be a cute idea for placemats!